What is a hands on review? The Bang & Olufsen Beovision Harmony is a wondrous meeting of design and technology – but you can get its core image proposition without bells, whistles and 'wings' much more cheaply. When you hear the word ‘television’, your mind probably conjures a black rectangle hanging from a wall or sat on a stand, only springing to life once it's switched on. The Bang & Olufsen Beovision Harmony, comprising a 77-inch OLED and integrated sound system, does things a little differently. Actually, a lot differently. Following in the footsteps of LG and Samsung with their efforts to make a TV live more seamlessly within its surroundings, the Beovision Harmony offers an opulent, transforming sound system as part of its package. It is impressive both mechanically and visually – but it comes at an audacious price, with some of its components available more affordably elsewhere. Launching in October 2019, the Beovision Harmony TV and speaker system will retail together for €18,500, which at the time of writing roughly converts to $20,780 / £15,945 / AU$29,245 / AED 76,500. If you’re familiar with the Bang & Olufsen brand, you’ll know that eye-catching design ideas are central to its premium-price-tag-pushing ethos. Take its curvy Beosound Edge speaker, for instance, or its wall mounted Beosound Shape speakers. So what makes the Beovision Harmony stand out from the crowd? That’d be the way its screen integrates with its built-in sound system. It’s not unusual these days for a TV to offset the sonic limitations of a flatscreen design by including a built in soundbar – the Philips 8804, for instance, uses a Bowers and Wilkins sound system, while the upcoming Panasonic GZ2000 features upfiring Dolby Atmos speakers in its casing. Bang & Olufsen’s approach is far more theatrical. Its sound system comes in two 'wings' – front-firing speaker panels that sit on a mechanical component that allows them to move as the TV boots up and switches off. When powered down, they sit vertically, coming together as a square, hiding the majority of the screen away and letting them be used solely for audio. Turn the TV on and they rotate away from each other, sitting parallel to the bottom edge of the TV screen, which rises to meet a comfortable eye level when placed on the floor. The Beovision Harmony will be available in either an oak wood and aluminium style, or a 'Grey Melange' fabric and aluminium look. Both can work with either a floor stand or wall bracket. Whether the look suits your taste will be entirely subjective, but there’s no denying it’s an ambitious design. Bang & Olusfen has aimed to blur the line between interior decorating piece and consumer tech product, and to our eyes it has done that well. But it also comes at a staggering price that will put it well out of reach of most consumers, despite the fact that its central display is based off an LG OLED TV design that, in the context of the Beovision Harmony, is relatively affordable by comparison. Which brings us nicely onto that display. 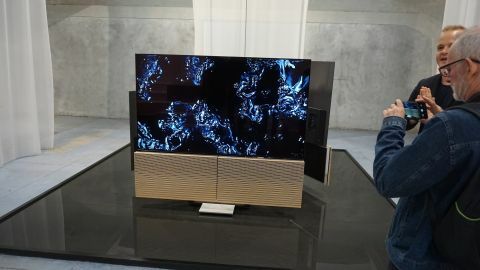 It’s gorgeous – but that’s as you’d expect, as it’s essentially the LG C9 OLED screen, the company’s 2019 flagship (barring the bells and whistles of its rollable OLED or 'Wallpaper' sets). You get then the deep, dark blacks, rich contrast levels, vibrant colors and HDR dazzle of a top-flight OLED, along with some of the latest advancements from LG’s Alpha 9 processing engine. This includes an 'AI' picture mode that automatically optimises the image based on a growing database of scenes it’s aware of, an ambient light sensor that also adjusts the tone mapping curve to ensure you don’t get a washed-out image when in brighter lighting conditions, and a color banding softener that makes for a less noisy image as it steps through gradients of tones, to name just a few tools working under the hood. It’s impressive as a result. But for some context, the LG C9 when sold separately is set to retail at a more affordable $6,999 / £7,499 (around AU$9,800). If you’re sold on the picture quality alone, and aren’t on the market for a sound system, that may be a more frugal option to consider. Having said that, much of the appeal here lies with that transforming sound system, and it’s also where Bang & Olufsen’s engineers have most made their mark on the performance of LG’s set. Even beyond the striking moving pieces, there’s a booming power to the Beovision Harmony’s audio output that you won’t find on a standard C9. Taking what the company has learnt from the Beovision Eclipse, and finding space for the improved midrange drivers that sit inside its Beolab 50 standing speakers, Bang & Olufsen’s screen’s sound system pumps out 450 watts across a three-channel array, each with their own amp. As a result, there’s a depth and musicality to the Beovision Harmony that you won’t find present in screens that don’t feature a discrete sound system. Bang & Olufsen’s DSP also features a bass management system and a built-in surround sound decoder, designed to work with Bang & Olufsen’s wireless speaker gear such as the Beolab 18, Beolab 50 and Beolab 90. You can hook up as many as eight of these wireless speakers with the set, with the Beovision Harmony capable of decoding 7.1 surround sound. All connected audio devices can be controlled by the aluminium Beoremote One remote that comes with the TV, and it’s worth remembering that, when the screen is in ‘standby’ and the speakers are folded, the Harmony can be used as a standalone audio system. AirPlay 2, Chromecast and Bluetooth connectivity are all included, and a portion of the dormant screen’s display will be dedicated to track metadata – unique to the Bang & Olufsen build of LG’s panel. As for interface, the screen shares LG’s improved webOS 4.5 UI, which puts cards of apps in a row along the bottom edge of the screen, offering up contextual content as you hover over an application. LG’s screen also supports Alexa and Google Assistant voice control – but we’ll have to confirm if this remains the case with the Beovision Harmony. We’ll update the piece as soon as we find out. If your interior decor is as important to your movie viewing habits as the quality of the screen itself, and if you’ve the space for a Scandi-styled 77-inch monster, the Bang & Olufsen Beovision Harmony will look very attractive to you. It’s TV-as-talking point, a piece of ostentatious industrial design that you can’t help but gawp at, that thankfully delivers on the visual and audio fronts too. However, it comes at an incredible cost, and if you’re to shop around for the separate LG C9 screen and a fully fledged home cinema system, you’ll likely be able to get a similar viewing experience (minus the Optimus Prime transforming routine, of course) at a much more affordable price. Best TV 2019: which TV should you buy for big screen action? Hands on reviews' are a journalist's first impressions of a piece of kit based on spending some time with it. It may be just a few moments, or a few hours. The important thing is we have been able to play with it ourselves and can give you some sense of what it's like to use, even if it's only an embryonic view. For more information, see TechRadar's Reviews Guarantee.